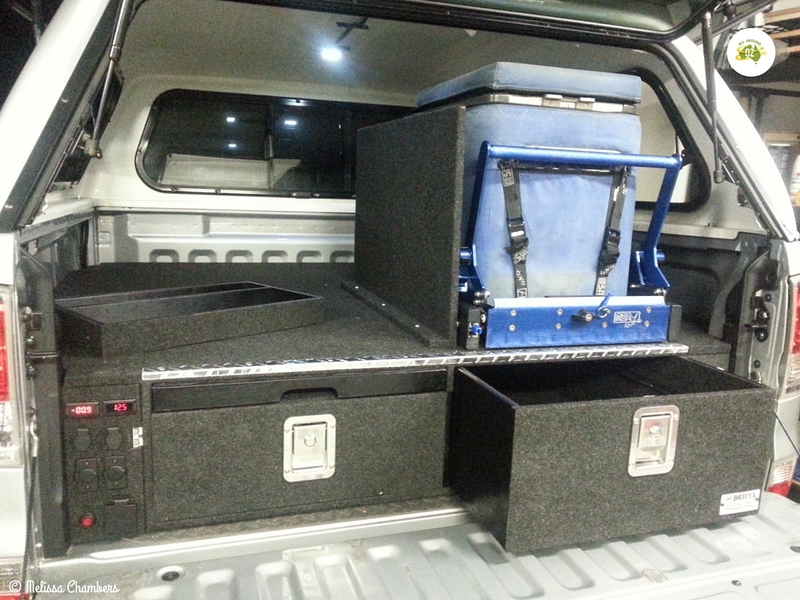 Even before we bought our Mazda BT50 we knew we wanted to install a drawer system with a fridge slide into the rear of it. As usual Brenden got stuck into researching what was going to be the best option for us. After a couple of weeks of diligent research and looking at what was available we settled on purchasing a set of Drifta Drawers. Our Drifta Drawer system and fridge – slide fully fitted. Drifta is a small family owned company based in the town of Gloucester in the N.S.W Hunter Valley region. Starting out in 2000 making camp kitchens, Drifta is owned by husband and wife team Luke and Kiyomi Sutton. All their products are manufactured in-house. They employ about 60 young locals, so by purchasing from them you are supporting small Australian business. Even before we took delivery of our Drifta drawers we knew we had made the right choice. Brenden’s conversations with Luke to organise the right drawer system for us made the decision even easier. Build time for the drawer system we wanted was about 3 weeks. 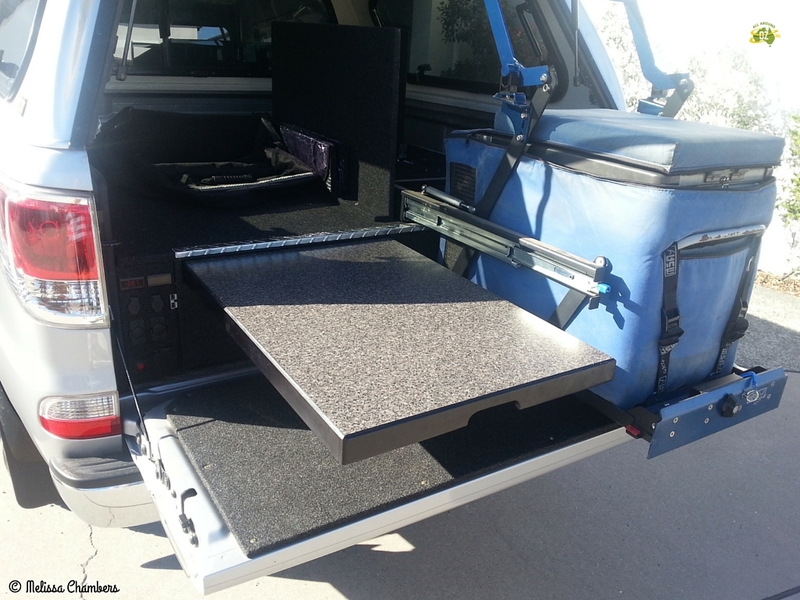 No matter what kind of 4WD you have, Drifta have a drawer system to suit your needs. We opted for drawers with a slide out table option. This gave us two full length drawers. The left hand one is slightly shallower to allow for the slide out table. All Drifta drawers are covered in marine grade carpet and the drawer runners are made of Teflon. This means no heavy metal hinges and runners. It also means that the drawers will still open and close with ease if they get dust in them. They also have good heavy duty latches on them. So you can be sure they will never come open, even when travelling over the roughest terrain. They are also lockable for a little bit of extra security. The drawer unit also came with side wings that cover up the wheel arches. In our case they hide the two extra batteries and electrics. Our very clever daughter helped design and make a panel for the left hand side that holds various gauges and power sockets. The right hand side panel has the fridge monitor mounted on it. 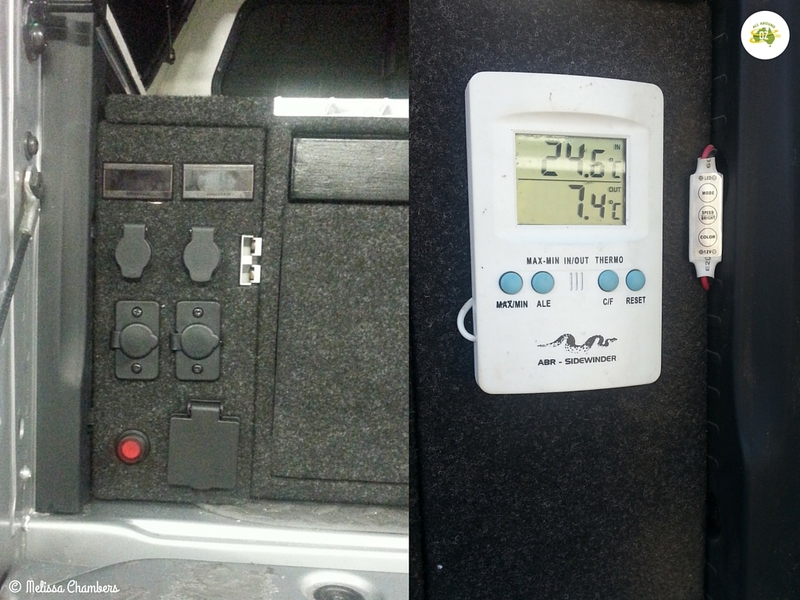 The two side panels hold various sockets and the fridge monitor. Starting with a bare tub, we decided to leave the rubber matting in the bottom of the tray before fitting the drawer body in. 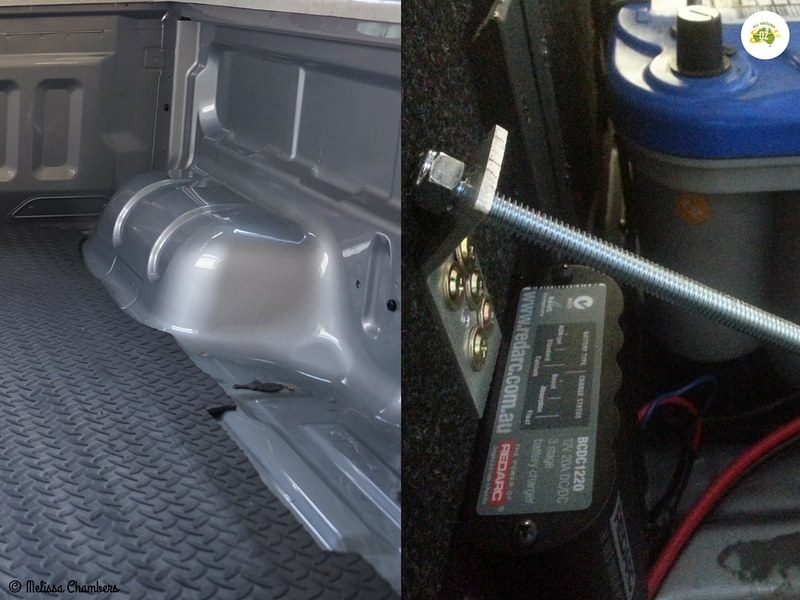 Leaving the rubber mat in turned out to be the best thing as it allowed the drawers to open over the tailgate board and carpet. By removing the drawers first, the whole unit was easily fitted into the back. To hold it in place, we used turn buckles attached to the inside of the tub in factory sockets – three on each side. Tub lining and one of the turn buckle screws that hold the drawers in place. The install was super easy and and accomplished without any trouble by Brenden and Master Oz. It took them the best part of a day but that included wiring in the extra batteries. To hold our Engel 40 litre fridge we chose a MSA Drop Slide because we think they are an awesome quality product. We have been so happy with our Drifta drawers. We think they were well worth paying that little bit extra for to get the quality that is so obvious in them. The added storage that we have gained from the drawers has been fantastic. We can fit so much in them, but because they pull all the way out, we can still easily access whatever we need. The table is also a very handy addition. Pull it half way out and you can quickly and easily make a bite to eat on the side of road or you can use it as an additional table at your campsite. It also has height adjustable legs which come in handy for food prep and cooking. Hi Melissa. Can you tell me what the drawers themselves are made from? Thanks for the supplied information and review. Wayne they are made of marine ply and covered in marine carpet. I tried to leave a comment before but I don’t think it worked, having issues with my internet. We just picked up a drawer slide for our fridge and now Dixie has to fit out our 4wd. I am a little worried because who knows what he is going to do! I’m sure he will come up with something brilliant! My hubby always does.